Busy 2017 for Johnny Fall Down. Killahora Orchards Operation Expands. Busy 2017 for Johnny Fall Down. This time last year, most of us heard about Johnny Fall Down for the first time. 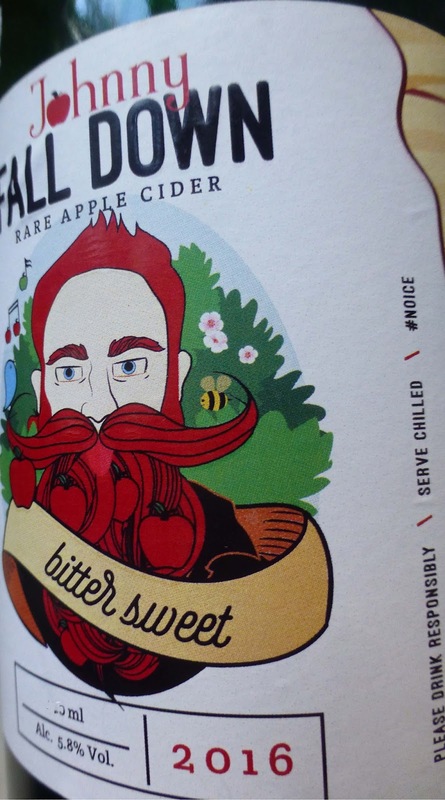 Their Rare Apple Cider was hitting the shelves. And not staying there very long as it was being snapped up. 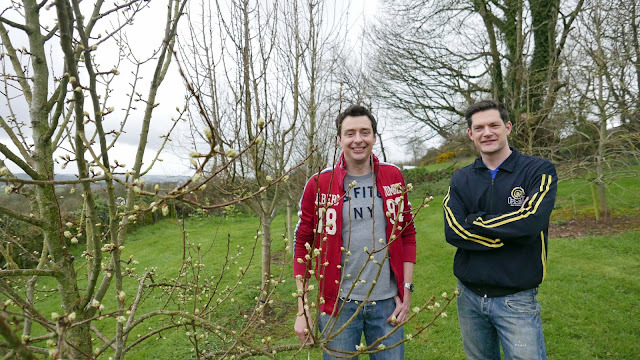 I first visited the orchard at Killahora, near Glounthaune, last March and met Barry and Dave. Dave has a particular interest in trees and plants while Barry is the man that turns the fruit into alcohol. The combination is a natural, has expanded and is expanding. Watch these warm south-facing slopes for more delicious developments. Then they had over forty apple varieties. Now, on last week's visit, they told me thay have over 114. They also have about 40 pear varieties here, the latest a bundle of young Welsh pears. A similar bundle is on the way from Austria (Barry is thinking schnapps!). 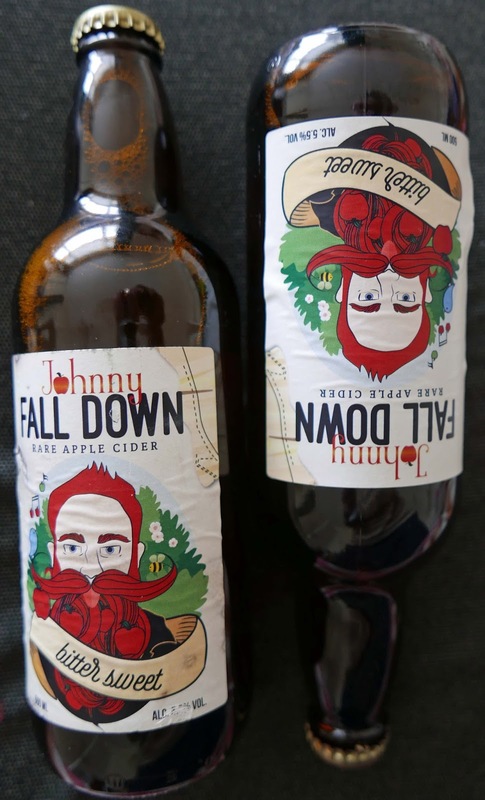 They now have three products available commercially, including the latest edition of Johnny Fall Down, their award winning Bittersweet Cider. 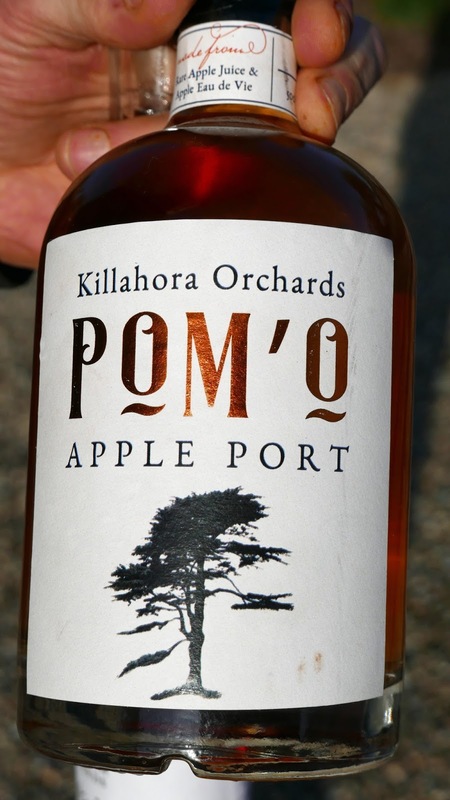 They have also created a uniquely Irish Rare Apple Port (Pommeau), and the first Ice Cider created mainly from Bittersweet varietals. I came across the Pom’O and the Rare Apple Ice Wine at SpitJacks on Washington Street where they form part of the amazing Cheese and Fortifieds Menu. More details about the Pommeau here . 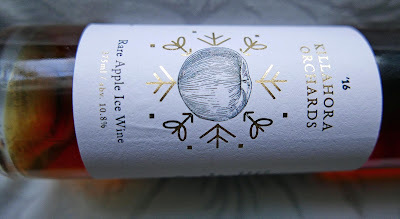 The Ice Wine which may, in the future, be barrel aged, is made from the juice of their rare apples, concentrated using freezing temperatures and slowly thawed. The resulting beautiful deep and rich must is slowly fermented for a year and stopped before completion, leaving half of the apple sugars intact…nothing is added, so the abv is a low 10.8%. 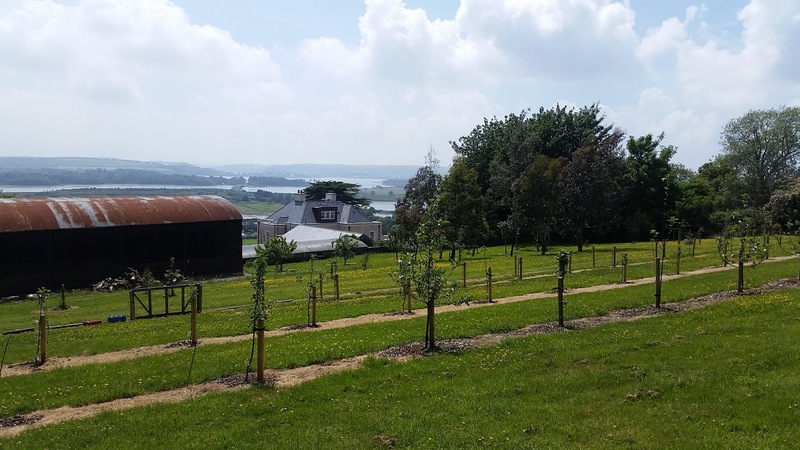 The south facing land exposed to the Atlantic, “gives us the opportunity to create an infinity of expressions of the land itself, that will surely change year to year, but we hope will retain a familiar style and optimum quality”. 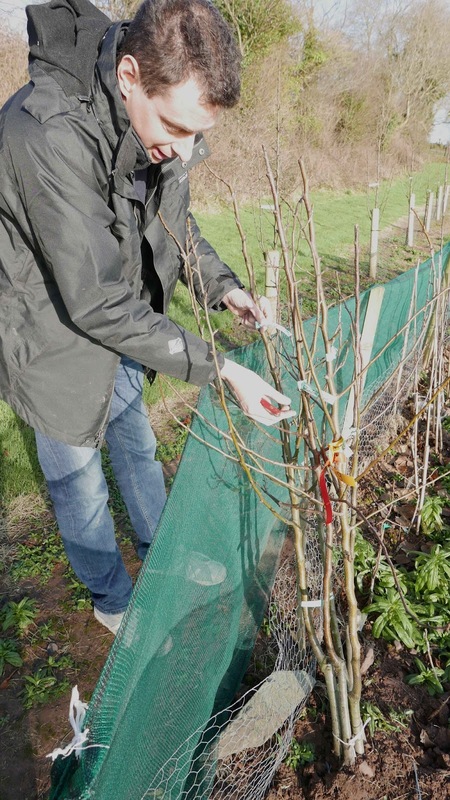 The pair are hugely enthusiastic about the future, Barry always thinking about the various blends that are possible and that will become possible as the trees mature. And it is not just the apples and the pears in their neat lines. 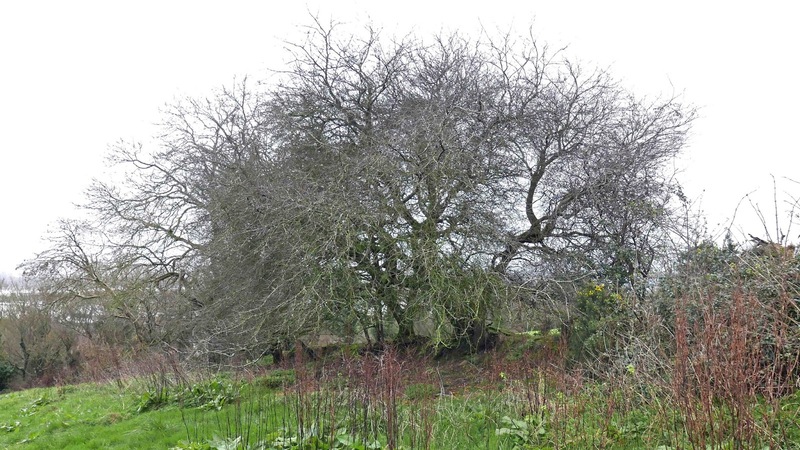 The hedgerows around their 30 or so acres include fifteen old crab trees, all with different characteristics that show in the fruit (apple babies don't grow up resembling their parents). Even months after the crab crop had been gathered in, there was still enough solid fruit on the ground to taste last week. The first one we sampled was close in taste to a normal green apple, the second on the opposite hedgerow, was much sourer. And, as if the 15 crab trees (some of them quite large) aren't enough, they have planted other fruits in amongst them. Early days yet! But it’s not all plain sailing. Storm Ophelia did some damage to the established fruit trees in the orchard and one or two in the hedgerow have been chewed by the local wildlife! OS Maps from 1838 show an orchard in the same place as it is today, with the same old walls bounding it, and the same south facing slopes slowly ripening the best of fruit. The revival is moving forward impressively and with help from Mother Nature! 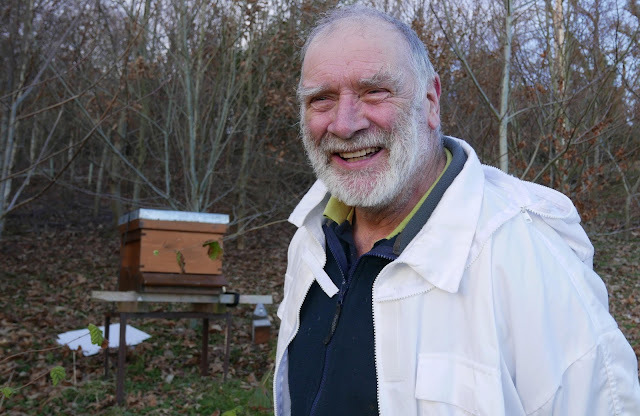 A beekeeper, Mick, has been recruited to set up hives around the orchards and we met him during the visit. The bees will be helping with pollination. Already though Barry is looking forward to an interesting honey. 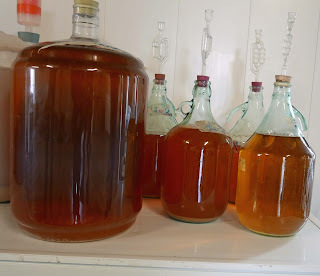 I think some of it will end up in bottles rather than jars! What is also interesting is that the operation has found a natural ally in the mixologists at Cask. They bounce ideas off one another and often find out that two heads are better than one. Recently, with help from others, they combined to make the world’s first single field cocktail! 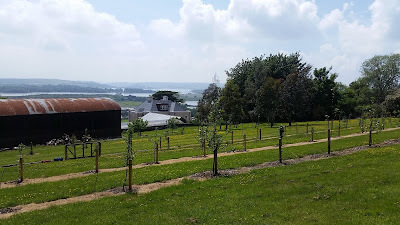 View of Cork Harbour from the Orchard: Fota Island stretches along centre from the left. See its folly (the tower on the point) just beyond the railway bridge on the Cork-Cobh line, both in right hand quarter of pic. 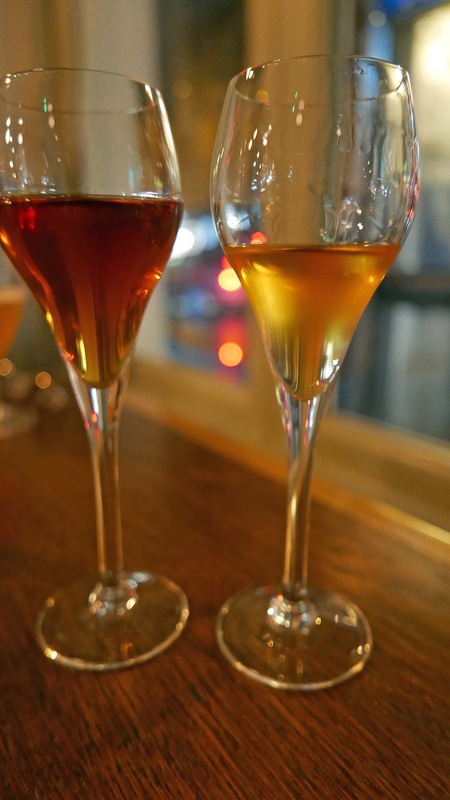 Barry thinks Cask is a marvellous place, one of the best in Ireland and the UK, and was not at all surprised that the McCurtain Street venue swept the boards at the Irish Cocktail Championships. Dave is just as enthusiastic (and knowledgeable) in his field. Last year, he showed his skill with tongue and groove grafting. 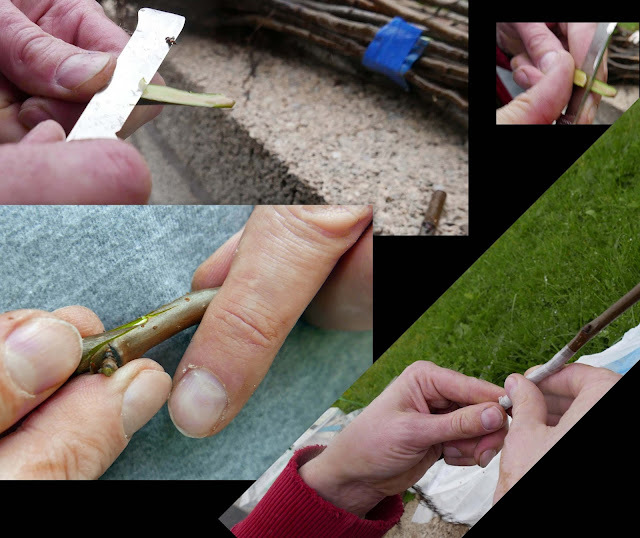 While not quite the season for it, this time we got an example of Chip budding which is one of the easier forms of grafting. A bud, rather than a shoot, is attached to a rootstock to produce a new plant. With practice, this technique can be mastered by anyone and, as just one bud is needed to make a tree, it is very efficient. Amazing how one tiny bud contains all the genetic material necessary to take over the host. If there’s a lot going on outdoors, there’s a hell of lot going on indoors. 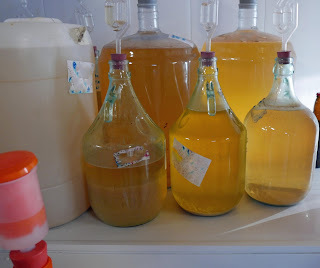 In the cidery itself, there all all kinds of containers quietly getting there. No doubt some “experiments” will be cut short but others will succeed. 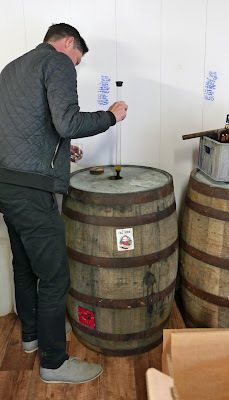 There are three ex Bourbon casks employed here. We got a taste of one, a very encouraging taste indeed with the promise of whiskey notes to come in some future Killahora product. So what can we expect next from Glounthaune? An apple champagne, no less! It is underway. Lots of bottles standing upside down in the cool cellar, a 180 year old shed. Just like champagne, the sediment will be frozen in the neck of the bottle, disgorged and then replaced with a dosage (a little sugar). The mind bubbles. The SpitJack's Superb New Menu. The SpitJack has hit the ground running in Washington Street and, with its first summer a success, has just announced its new winter menu. I took the opportunity to try it out in mid-week. The meats as you’d expect, as SpitJack is a rotisserie, are top notch but the real surprise was the new Cheese and Fortified Menu. Not too many of our top restaurants will match this magical list of possible combinations. And the good news is that there is quite a local input. Near neighbours, Ardsallagh Goats and Johnny Fall Down, feature strongly. The inventive Glounthaune drinks outfit are doubly represented with a Pom’O Apple Port and a Rare Apple Ice Wine. 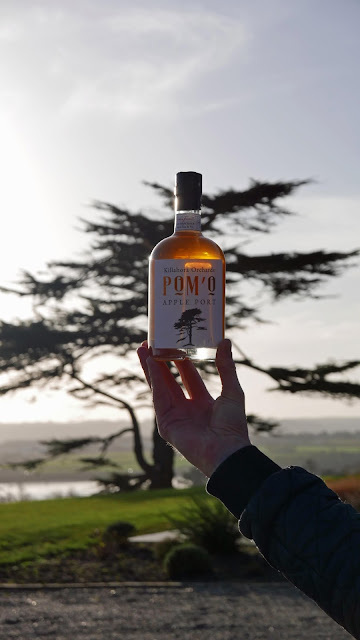 The Pom’O is based on the traditional Normandy pommeau (pressed apple juice with apple brandy) but the Glounthaune orchard has added a twist or two of their own to make this beauty. They used rare apples and then a combination of freezing and thawing, a year long fermentation and nothing at all was added to make the Ice Wine, the first Irish ice wine to be sold. It is beautiful and rich and perfect with the cheeses that we had and with the Ardsallagh Ash Pyramid in particular. Ardsallagh have a much longer history in the East Cork area than Johnny Fall Down but Jane Murphy continues to innovate and this is her first ash pyramid. Made from pasteurised mild goats milk, it is formed into the traditional Valencay shape and sealed in ash. Got an early taste during the Culture Night but this is the first commercial batch and it won't be the last. The Ardsallagh was served with Fig Compote. Our second cheese was a favourite of ours from our (too) few visits to the Basque country. It is a sheep cheese from Ossau-Iraty a area of the Pyrenees where we got “lost” once or twice. In the Basque country, they often serve it with a Black Cherry conserve (I use Loganberry jam at home! ); last night, SpitJack’s Quince paste was excellent. Then we finished with the Comte AOC from the Jura mountains, served with truffle honey. This 24 month vieux is a beauty, delicious, and enhanced by that honey. 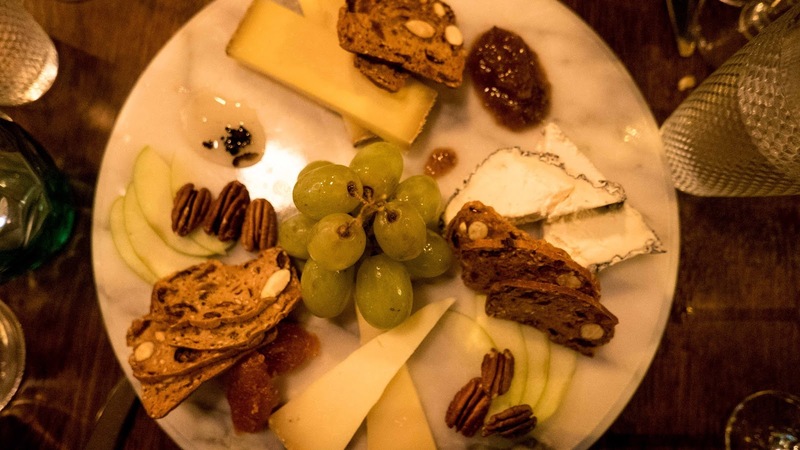 Other cheeses on this impressive list include: Brillat Savarin, Camembert Bonchoix AOC, Cashel Blue Mature, Durrus Og, Epoisses AOC, Manchego 18 months PDO, Pont L’Évêque AOC, and Stilton PDO. There are three Quinta Seara D’Ordens signature ports on the fortifieds list while dessert wines include Chateau Camperos Sauternes and a couple of sherries, a Colosio PX and Orleans Borbon Manzanilla, plus the two Johnny Fall Down drinks. The new menu, like the previous one, is well constructed, in the sense that, if you wish, you can avoid meat in the starters and that’s what we did. 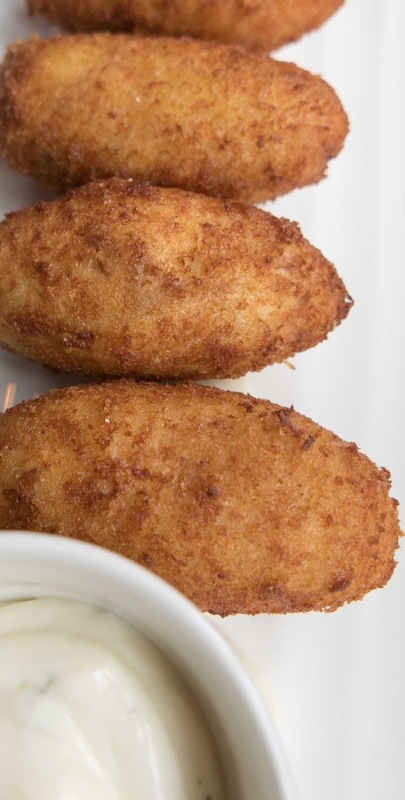 Salted cod is an Atlantic tradition so I was delighted to see the House Salted Cod “Bunyols” (€8.5) Catalan Style Cod Fritters, Flaked Salted Cod, Fried Crisp Exterior, Soft Pillow Centre, Lime Chantilly, delighted too that I choose this tasty plateful. Across the table, CL also made a good pick. The pickled Heirloom Beetroot Carpaccio (€7) with Ardsallagh Goats Cheese Foam, Candied Walnuts, Tarragon Oil, Watercress, looked well and tasted well. On now to the main event, as my Eight Degrees Sunburnt Red Ale sank in the glass. Time for the Rotisserie Pork Belly Porchetta (€17), Slow Roasted Pork Belly Stuffed with Sage & Garlic, Crisp Crackling, Kale Colcannon Potatoes, Braised Kale & Apple Compote, Sautéed Tender Stem Broccoli, Honey Mustard Jus. “Savage,” as we say around here. The word’s not the most sophisticated but, when pronounced with soul, means the meat (in this case) is rather good my dear. 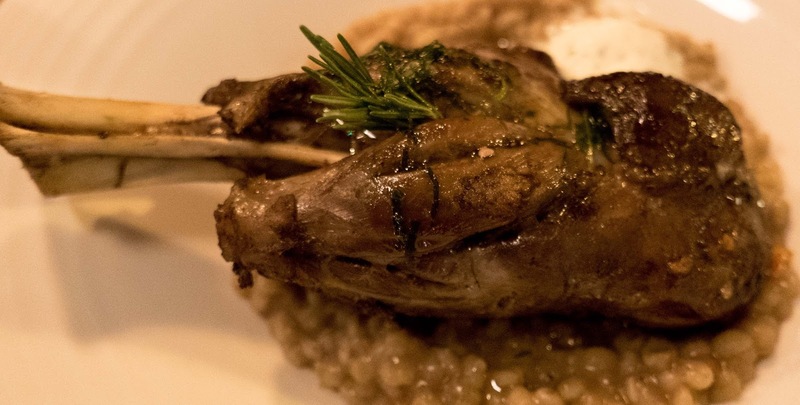 And it also may be applied to CL’s earthy choice, a peasant’s pleasant pot in winter time of Brazed and Rotisserie Roasted Lamb Shank (€19.00), with Red Wine Glaze, Pearl Barley & Winter Vegetable Cassoulet, Crème Fraîche, Mint Oil, Braised Lamb & Brandy Jus. 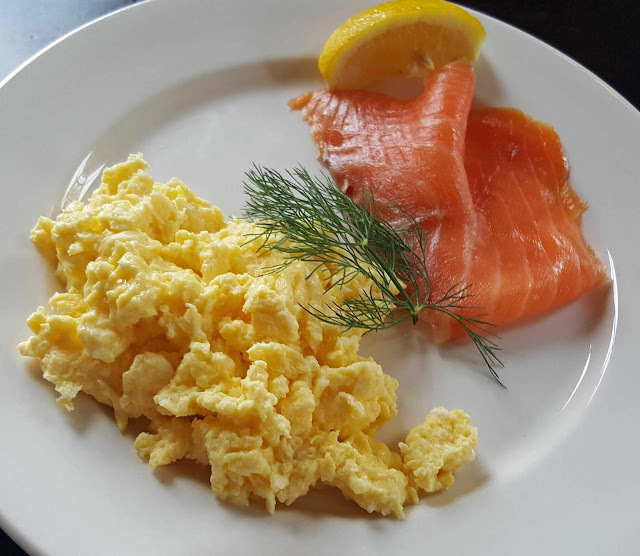 Local and seasonal, simple soul food, simple but superb. So two very happy customers and that was before the cheese and Johnny Fall Down took us to a higher level! Just west of the city, Mark Hennessy raises a few free range pigs. To the east, Johnny Fall Down makes an award winning cider. Put them together and you have our Taste of the Week! In the city’s English Market, butcher Eoin O’Mahony makes crépinettes (and more) from the limited supply of Hennessy’s pork. When I arrived there on Saturday morning, he had sold out but was about to make more! In the meantime, I headed up to Bradley’s and got a few items including the 2016 Johnny Fall Down, reckoned to be better than the initial 2015 and “flying out the door”. Back at the Market, I picked up my crépinettes (six for a tenner) and headed home. They were in the bag with the cider but I had no idea at all at that stage that I'd be putting the two together that evening. Had a chat with the official blog chef and hatched the plan. The pork would be started in the pan and finished in the oven, a cream, butter and tomato sauce would be added along with some mushrooms. And we’d pair it with the cider. It turned out to be a match made in Cork (otherwise known as food heaven), just perfect. Either would have been good on its own but together they were outstanding. 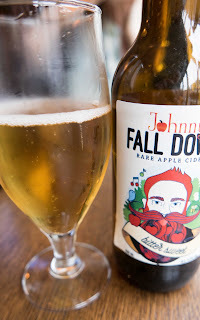 The Johnny Fall Down Rare Apple Cider 2016 has an ABV of 5.8% and cost €7.50 for 750ml at Bradley’s. This pure, strong bittersweet cider is made from no less than 47 varieties of cider apple, most grown on the warm south facing slopes of Killahora. 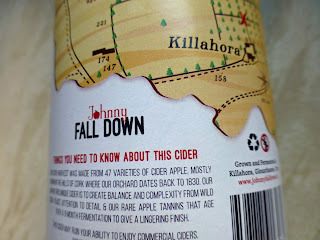 They warn that if you still have any lingering love of commercial cider, this will liquidate it! Due to the limited supply, O’Mahony’s won’t have these crépinettes every week but Eoin may well have others. Recently he did kid and veal. On Saturday, Eoin told me he had six of Hennessy's hams curing so they should be available any day now! There is something special about going into a restaurant for the first time, meeting people you've never met before and feeling right at home within a few seconds. That was the feeling I got at The SpitJack, the new Washington Street (Cork) restaurant. And that was before the beautiful food began to appear. Big credit here to owners Richard Gavin and Laura Sureda and their wonderful staff. The owners have spent a lot of time and effort, not to mention money, in getting this place looking perfect, a place where once a medieval lane ran through. Lots of exposed brick in both downstairs and up. The highlight is perhaps the skylight, or at least, the area under it. The ground floor bar is lit by this light and its shelves extend upwards to the roof. You can see it at its best as you go to the upstairs dining room (or the lovely semi-private room, for 8/10, just off it). Both the medium sized dining rooms are lit by light from the south and are bright and airy and busy and buzzy, even if they are still in soft opening mode (that may change this week). I’ll let Richard and Laura introduce their place: The SpitJack is a rotisserie concept and the first of its kind, offering only the highest quality Irish produce. 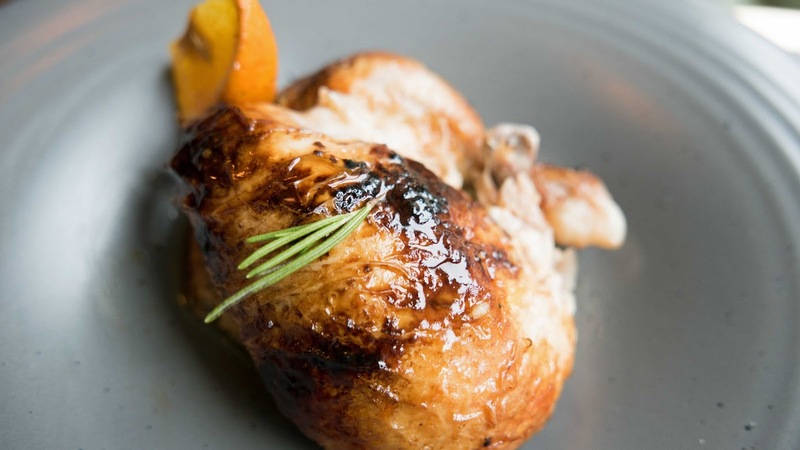 All of our menus revolve around the rotisserie and we are opened from breakfast to bedtime. We, and indeed all customers, were taken through the details of the menu and there were helpful suggestions as to what wine or side dishes go best with your order. And service continued in that helpful vein all through the meal. We were guests but could see and hear that all customers were getting the same treatment. There is a full bar so a great choice of spirits, including Dingle Gin and Vodka, Gunpowder Gin, lots of Irish (and international) whiskey, also tasting boards, local beer (including 8 Degrees) and the lovely Johnny Fall Down cider (my choice on the night). Didn't get to try any of the many cocktails - they have their own mixologist. Here’s an intriguing one: the Barrel Aged Midleton Hip Flask (Jameson Black Barrel, sour malt and Chard reduction-recycled mash from our friends in Midleton, Lillet blanc and orange bitters. Just one of many. Nothing gets wasted here; they are always conscious of sustainability, using surplus ingredients to make their own garnishes, infusions, purées, cordials and shrubs. “No ingredient gets left behind.” And they support local. 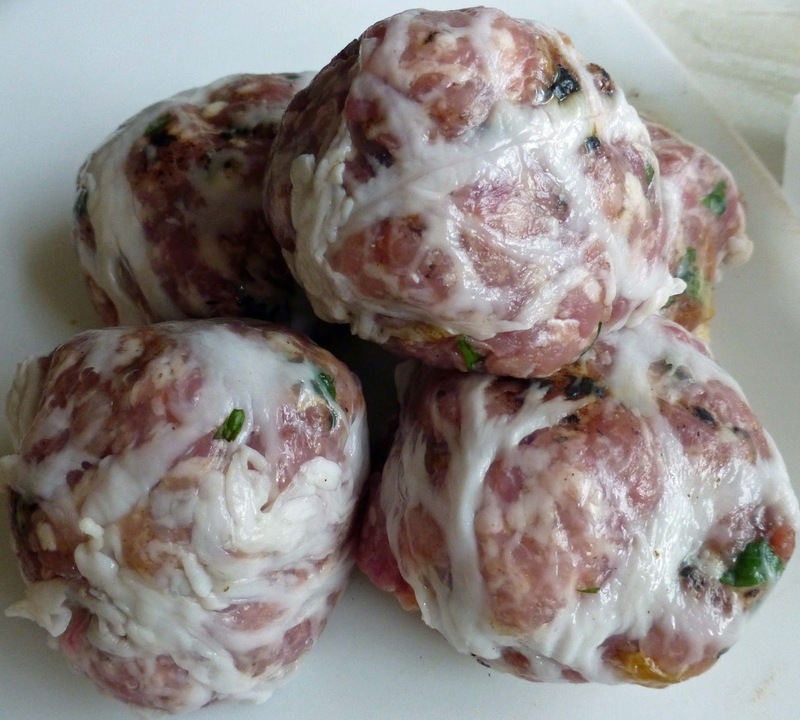 Their meat, for instance, comes from O’Mahony's Butchers in the nearby market. 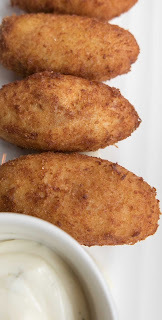 Down to business with Rotisserie Chicken Croquettes with a lemon and thyme aioli. 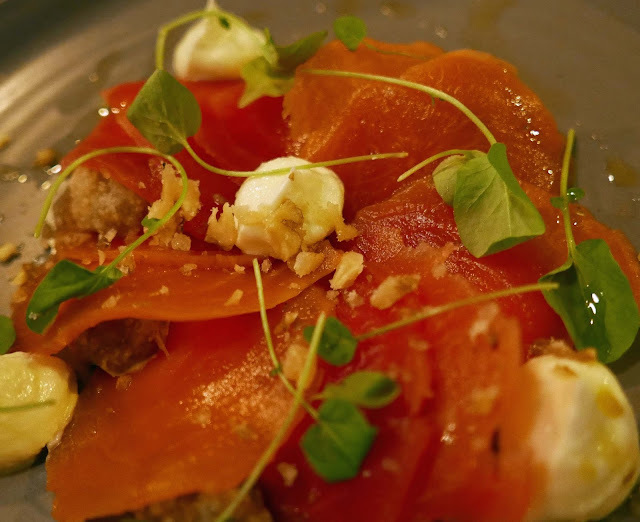 Laura is from Barcelona and her influence was evident here in their tapas style opener. A delicious sign of things to come. 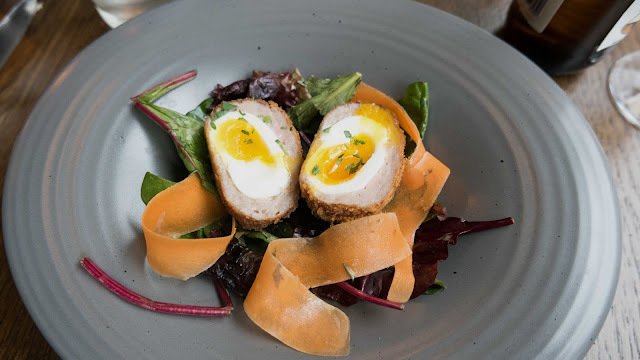 My starter was their Scotch Egg (soft egg wrapped in English Market Italian Sausage with a crisp crumb). Fifteen minutes is the cooking time but it is well worth the wait. Gorgeous and it comes with a beautiful salad as well. CL went for a salad: the honey baked Goat Cheese Salad. It comes in two sizes! 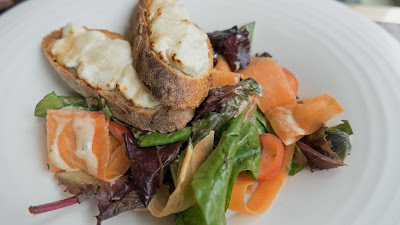 They use Ardsallagh cheese on crostini, carrot ribbons, cherry tomato, local mixed leaves and tarragon dressing, more or less the same salad that came with the egg. Another delicious combination. 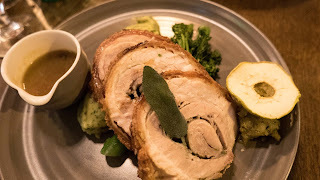 My cider came into its own with my main course: Porchetta of pork-belly, stuffed with garlic and market herbs (sage mainly). 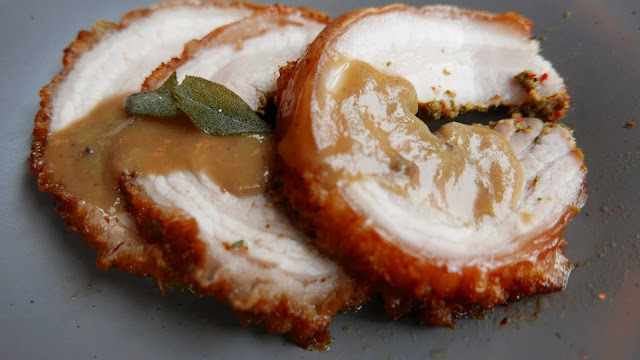 And a tasty rim of crackling. Have had lots of excellent pork-belly since it came into fashion a few years ago but hard to beat this beautifully cooked effort. Great match with the cider! 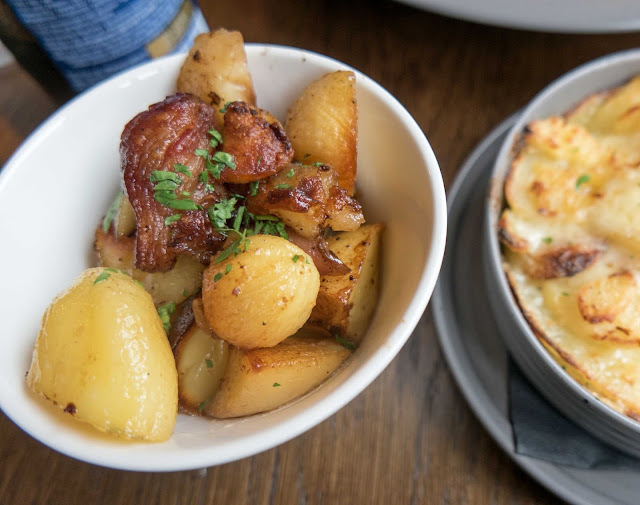 You get one side (you may order more) with your mains and I was advised to take the classic potato and gruyere gratin. It was spot-on, a rich and cheesy delight. CL’s side - we did share - was another gem. 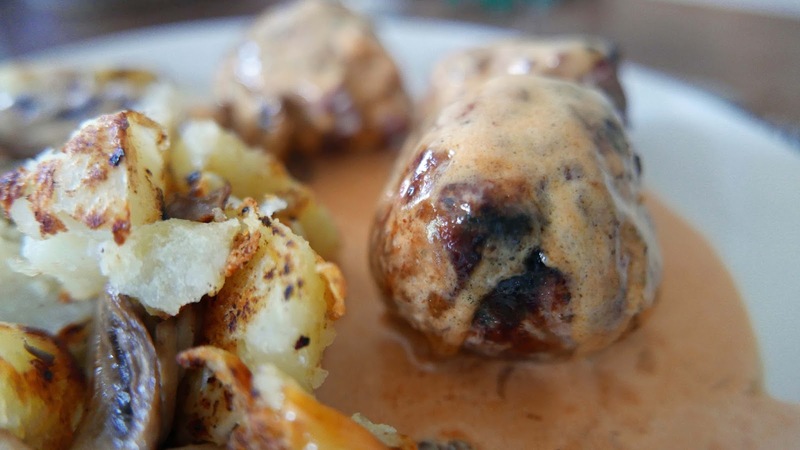 The Rotisserie Roast Potatoes is a rather underrated description. The spuds, with little bacon bits, were roasted under the chicken, the juices falling down and working their magic. The West Cork Rotisserie Chicken, by the way, spent 24 hours bring brined with Rosemary, Thyme and Lemon. And you get a breast and leg to enjoy at your leisure! Cooked to perfection and absolutely delectable. They’ve certainly mastered their roasting machine in the few weeks of the soft opening! And, of course, there was a sweet finish, a shared one. The dessert list is short but excellent. I noticed the rotisserie had come into play in one: the Coconut Panna Cotta (with Rotisserie Pineapple and a rum and raisin shortbread). As with the previous plates, there was nothing not playing a part on this one. 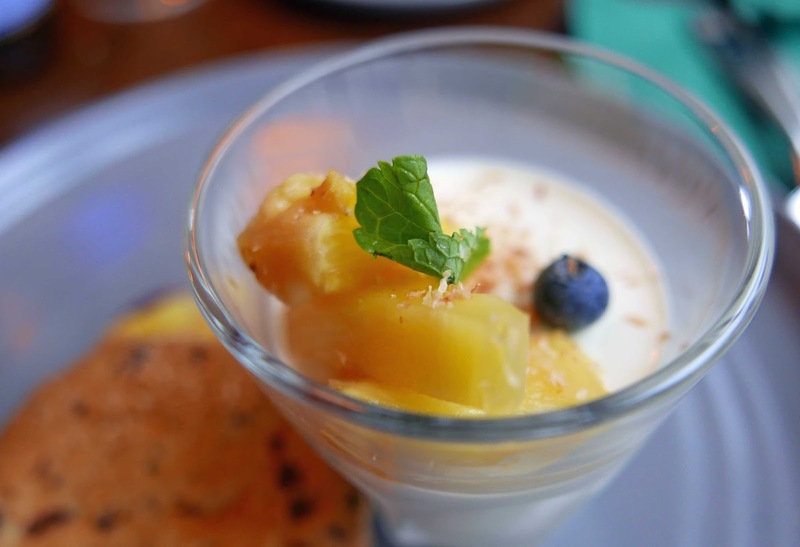 The Panna Cotta itself was excellent while the shortbread made the taste buds sit up and notice even at the end of a magnificent meal.